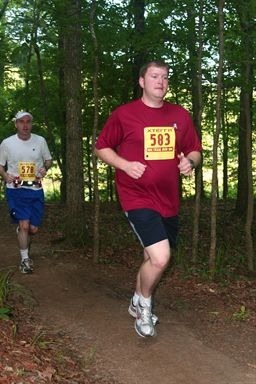 This was my first race at Oak Mountain. One of my running guys at work and I did almost the same route as the race a few weeks prior to the race so we would know what we were in for but it was much hotter and humid on race day. I thought I was getting there early on race day morning but when i was nearing the entrance the traffic came to a stand still. 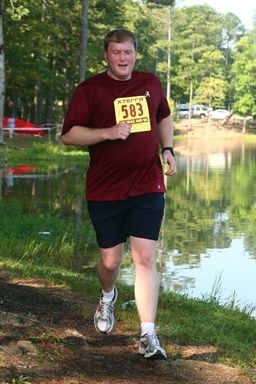 luckily, they pushed the race a few minutes later so i had just enough time to get my bib number and get in line before the race started. the race went pretty good for me at the beginning but when we hit the infamous yellow trail it all went down hill. I got a heart rate monitor earlier this year and was checking it pretty often throughout the run. On the yellow trail i managed to stay at about 84% of my max on the down hills but on the up hills (and by hills i mean mountains!!!) it was about 94%. Thatâ€™s 94% while WALKING up a mountain VERY SLOWLY!!!. Typically on normal runs i can maintain about an 82% for a whole run. there were three water stops and I took them all! I was pretty exhausted by the end. The end of the race was different than what i ran previously in that they took you down by the lake and made you go through a mud pit at the end. I was in my good Nike running shoes and had my Nike plus chip in so i took a penalty and bypassed the mud pit. 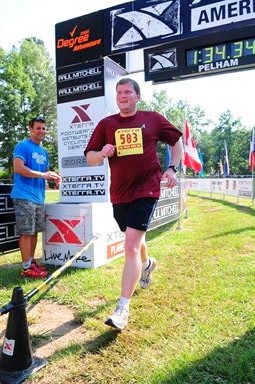 Previous Previous post: Warrior Dash 2010 – My first obstacle race!